My garden pictures and pet photo contest was quite a difficult to judge with so many wonderful submissions received. To remain objective, our judges judged the entries by awarding points for picture quality, composition and the accompanying story. The points were added together and the submission with the highest points awarded the grand prize. The two submissions with the next highest points were selected as the garden pictures and pet photo category winners. The grand prize winner is Merle from Toronto Canada. Here is her winning entry! Well done Merle! 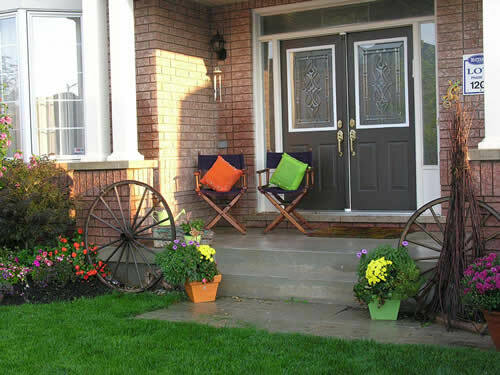 Your garden picture is an excellent example of integrating your garden with your home. A garden should be an extension of your home. The picture also shows that even a small garden could have a large impact on your home. It is good to see that Merle has applied many principles taught on my garden design page ! Merle won a complete landscape design as described on my residential garden design page. The winner of the pet photo category is Theresa M. Caputo of Lakeland, Florida with the following submission. Our dog, Rebel, jumped up and sat on the couch as my husband was leaving to go to the store. He put his head down and rested it on the cushion. Since he knew he was not going with him, he looked as if he was waiting for to come back with a goodie! What a pleasing photo! A clear photo with almost perfect color coordination and positioning, an interior decorator couldn’t have done it better. I love the expression on his face! 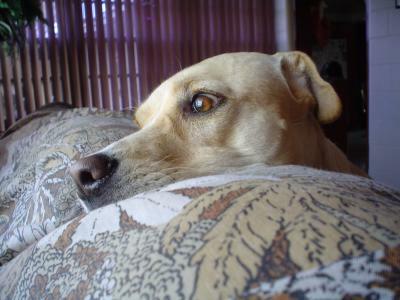 See the other entries in the pet photo contest. Wow! So may beautiful flower and garden pictures! Unfortunately we could only have one garden picture category winner, and he is Koos from Oakville, Ontario, Canada. 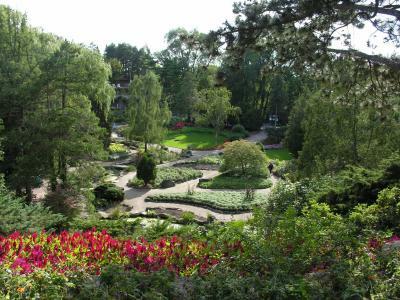 My favorite garden is the rock garden of the Royal Botanical Gardens located in Burlington, Canada. This is one of the best views. Standing on the embankment you can look down and see most of the garden. The view is magnificent and I never fail to marvel at the beauty of the trees, flowers and garden layout. Not to mention the birds and squirrels that abound. In the picture I can see that many of the principles taught by Alison were included in the garden design. The large trees frame the garden and the pathways quickly focus your eyes on the specimen tree on the beautiful green lawn. You actually feel like going down there and lie down on the soft grass, enjoying the light breeze blowing through your hair, listening to the birds, smelling the clean air…. This is a beautiful garden photo and story. I love the colorful foreground and the way in which the composition draws your eye toward the focal point. This garden will definitely be on my itinerary when I visit Canada. See the other garden pictures entries.